This twist on the classic cornbread is fluffy, slightly sweet and perfect alongside your next soup, stew or chili! There’s just about nothing I love more on a brisk evening than a big bowl of spicy chili, and nothing better alongside it than this pumpkin cornbread! Whether you need a scrumptious side dish for soups, stews and chili, or just a creative way to use that leftover puree, THIS is it my friends! Fluffy, scrumptious and slightly sweet, this cornbread calls to be paired with your favorite cozy fall comfort foods. It’s easy to whip up – all you need is one bowl, basic ingredients, and a bit of patience while it bakes! Spread it with a bit of butter, drizzle over a little honey or enjoy this easy, delish cornbread as is. You can also grate a little cheddar or Parmesan into the batter before baking, or toss in some chopped herbs. In a medium bowl, stir butter, sugar and honey together. Whisk in egg. Whisk in baking soda, buttermilk and pumpkin puree. Add salt, cornmeal, and flour. Do not overmix. As soon as the flour disappears, stop mixing. Add batter to a greased 8-inch baking dish and smooth out the batter. Bake for 25 minutes, or until top is golden brown. Prick the center with a toothpick and if not clean, bake for about 5 more minutes. Serve with additional honey and butter, if desired. Chili and pumpkin cornbread – I can’t think of anything better! I’m impressed! I don’t know how you came up with this, but you have me craving chili with cornbread! Mmm, this is a perfect side to chili! I love the addition of pumpkin! I don’t know why I haven’t thought of adding pumpkin to my cornbread. Brilliant!! 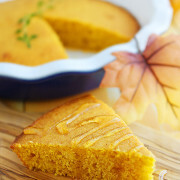 I never thought to put pumpkin in cornbread; it sounds amazing and looks beautiful. Yum! Cornbread and Fall are just perfect together, aren’t they? Cornbread and Fall are perfect together, aren’t they? I have such a soft spot for baking with cornmeal and honey together, this is a wonderful recipe! Love it! I’ve been adding pumpkin to so many things for fall but I would have never thought of cornbread. Great idea! Gorgeous and looks really yummy! We’ve been slightly obsessed with cornbread over at our house lately so this is going into the recipe rotation soon. Thanks! Pumpkin and honey together in cornbread is absolutely brilliant! Amazing! What a wonderful, yummy idea! We tried this for dinner tonight. I subbed sour cream for buttermilk, that’s all we had :) and it was very good! It is a brilliant flavor combination! Kudos! Soooo good! I substituted the buttermilk for plain kefir. Thank you for the recipe. The family loved it! Did you use ap flour or self-rising? Wonderful, a must try! Thanks for sharing. Totally used this today with my pumpkin puree I had left! So delicious! Thank you for sharing. Happy Thanksgiving! This was fantastic! I cooked it in a 10″ cast iron skillet. It was my favorite part of our Thanksgiving dinner!! !